One of the main claims of the supporters of division – or “separation from the Arab neighborhoods of Jerusalem” – is the demographic argument: if we just free ourselves of the areas and the neighborhoods that we annexed to Jerusalem in 1967, areas in which about 300,000 Palestinian residents now live, our demographic situation will improve. There is, however, another way to deal with the demographic situation, without incurring the difficult security and municipal problems likely to result from such a “separation,” and we will present them here. The strength of a city is not only measured in terms of the number of its residents and the makeup of its population. It also concerns their economic attainments, the city’s appearance, its residents’ quality of life, and its power of attraction as a place of residence for various populations, especially young ones. At the same time, since Jerusalem was unified in 1967, its borders widened, and many of its Arabs given resident status, the demographic future of the city’s Jewish population has been a concern of Israeli governments, the leaders of the city, and its planners. This concern has fostered an ongoing struggle to preserve the Jewish majority, with the key question being the numerical ratio between Jews and Arabs. It was also natural that the Israeli government’s demographic policy in Jerusalem should be directly influenced by the fact that for 19 years the city had been divided. The country’s leaders had not hidden their concerns about an Arab minority, with its national awareness and national leadership that constituted a majority within its own territory. They feared that one day the Arab residents of Jerusalem, who had now been annexed to the state of Israel, would demand to fulfill their national aspirations – whether through a redivision of the city, linkage with a Palestinian state, or in some other fashion. To a great extent the demographic perspective (along with security considerations) also determined the boundaries of the city, to which was annexed, after the Six-Day War, about 70,000 dunams to the north, south, and east of the old jurisdictional boundaries. The main consideration guiding the decision-makers in drawing the map was to take control of the maximum territory with the minimum Arab population, and preclude any future division of the city.3 The establishment of the Jewish neighborhoods in the many empty lands that were annexed to Jerusalem, neighborhoods in which about 200,000 Jews now live, was also intended to guarantee – both territorially and demographically – the Jewish majority in Jerusalem and prevent the possibility of a redivision. Over the years, the demographic target that the Israeli government set for itself changed. During the past three decades the large-scale migration of Jews from Jerusalem to the periphery, together with the growing urbanization of the Arab population and the migration of additional Arab population into Jerusalem, have been among the factors leading to a decrease of the Jewish majority in Jerusalem. Area: Jerusalem is the largest city in Israel. Its area extends over 126,000 dunams, more than twice the area of Tel Aviv or Haifa. “East Jerusalem”: An all-encompassing name for the lands beyond the “Green Line,” which were annexed to Jerusalem to the east, north, and south of the old jurisdictional boundaries immediately after the Six Day War. Before 1967 the territory of the Israeli city comprised 38,000 dunams. The area of Jordanian Jerusalem came to 6,000 dunams, for a total of 44,000 dunams. At the end of June 1967 Israel annexed another 64,000 dunams to Jerusalem from 28 villages adjacent to it; thus Jerusalem’s area grew to 108,000 dunams. An additional annexation of lands west of the city, carried out in the 1990s, increased its area further to 126,000 dunams. The fence (“Jerusalem envelope”): Stone walls, iron fences, natural, electronic, and artificial barriers that join together for a defensive line of 168 kilometers, which is intended to obstruct terror from outside the city. The route known as the “Jerusalem envelope” runs mainly along the municipal jurisdictional border, but in the north it also runs within it, and de facto excludes tens of thousands of Palestinian residents from the city. The building of the fence led tens of thousands of Palestinians with blue Jerusalem residency cards, who had previously lived outside the city, to move to the “Israeli side” of the fence. The route of the fence also encompasses communities within Greater Jerusalem such as Givat Ze’ev, Maale Adumim, Gush Etzion, and Beitar Illit, though in the direction of Maale Adumim and the Arab village of Battir, for example, the fence is yet to be constructed. The building of the fence led to a decrease in terror but also dealt a severe economic blow to east Jerusalem, whose residents were effectively cut off from the Palestinians in the Palestinian Authority. So far about 80 percent of the “Jerusalem envelope” has been completed. For budgetary reasons as well as residents’ opposition, about 20 percent has not yet been built. The population’s growth rate: At present the growth rate of the Arab population is two and a half times higher than that of the Jewish population. Over the years the rate of natural increase (the difference between the number of births and the number of deaths) for Jerusalem’s Arab population has been considerably higher than that of the Jewish population, though today it has diminished. From 1967 to 2012 the Jewish population grew 2.7 times, the Arab population 4.2 times. Intercommunity migration: In 2012, 19,200 residents left Jerusalem for other communities in Israel and 10,500 new residents moved into Jerusalem from other communities in Israel. Jerusalem’s migration balance has been negative for many years. Age of the population: Jerusalem is characterized by a youthful age structure – a relatively high rate of children and a relatively low rate of adults. In 2012 the proportion of children (ages 0-14) for the total Jerusalem population came to 34 percent, compared to 18 percent in Tel Aviv, 19 percent in Haifa, and 28 percent in Israel as a whole. Children constituted 32 percent of Jerusalem’s Jewish population compared to 39 percent of its Arab population. Poverty, employment, and income level: According to data of the Central Bureau of Statistics, 36 percent of the families living in Jerusalem are under the poverty line (21 percent of the Jewish families and 77 percent of the Arab families). Sixty percent of the city’s children are defined as “poor.” The rate of workforce participation in Jerusalem at the main working ages (25-54) is low compared to Israel as a whole: 68 percent in Jerusalem compared to 82 percent in all of Israel and 90 percent in Tel Aviv. In addition, 48 percent of all employees in Jerusalem work in the public sector, where the average salary level is low, and only 7 percent work in the industrial domain. The number of wage earners in Jerusalem is also small, and they are responsible for the livelihood of many people. The average monthly (net) income of households whose heads are salaried workers is lower in Jerusalem than in comparable households in Israel as a whole, in Tel Aviv, and in Haifa. In 2011 it came to NIS 13,500 in Jerusalem compared to 18,800 in Tel Aviv, even though the average number of persons per household in Jerusalem is larger: 4.3 compared to 2.5 in Tel Aviv and 3.7 in Israel as a whole. Population size: At the end of 2012, as noted, the population of Jerusalem numbered 815,300. The Jewish population came to 515,200, the Arab population to 300,200. Thus the Jewish population of Jerusalem constitutes 63 percent of the entire population, while the Arab population makes up 37 percent. The proportion of the Jewish population of the city declined from 74 percent in 1967 to 72 percent in 1980, 66 percent in 2006, and 63 percent in 2012. Meanwhile, the Arabs’ share of the city’s population rose from 26 percent in 1967 to 28 percent in 1980, 34 percent in 2006, and 37 percent in 2012. Birthrate (number of births annually per thousand people): Jerusalem has a high birthrate. Two populations contribute to it: the ultra-Orthodox Jewish (haredi) sector and the Arab sector. In 2012 Jerusalem’s birthrate stood at 28.2 births per thousand people, compared to 21.6 births per thousand people in Israel as a whole. In recent years the birthrate of the Jewish population of Jerusalem has been higher than that of the Arab population: 28.7 births per thousand people for the former, 27.3 births per thousand for the latter. Up until 2010 the Arab population’s birthrate was higher than the Jewish population’s. In 2011 the rates were almost identical, but in 2012 the trend reversed. Over the years, however, Jerusalem’s Arab population has seen a sharp decline in birthrates: from 42.5 births per thousand people in the 1970s to an average of 31.8 births per thousand people from 2000 to 2009. In 2010-2012 it declined further to 28.3. Overall fertility rate (the average number of children a woman will have during her life): The overall fertility rate of Jerusalem women is relatively high in Israel: 4 in Jerusalem compared to 3.1 in the country as a whole. The overall fertility rate of Jewish women in Jerusalem is higher than that of Arab women in Jerusalem: 4.3 vs. 3.6. Recent years have seen a notable upward trend in the Jewish population’s fertility rates both in Jerusalem and in Israel generally compared to a downward trend for the Muslim population. In Jerusalem the increase is mainly affected by the high overall fertility rate of haredi and religious women. Mortality: The Arab population’s mortality rate in Jerusalem is considerably lower than that of the Jewish population – 2.6 deaths per thousand people among the Arabs compared to 5.4 deaths per thousand people among the Jews. The disparity is caused by the fact that the Arab population of Jerusalem is younger; by the sharp decline in the infant mortality rate among the Arab population (from 45.2 deaths per thousand in 1970 to 6.5 today); and by the improvement in health services and preventive medicine. Natural growth (the difference between number of births and number of deaths): Natural growth in Jerusalem is the main growth component of its population, and it is significantly higher than that of Tel Aviv or Haifa. In 2012 natural growth added 19,200 people to Jerusalem – 62 percent Jews and 38 percent Arabs. At the same time, the Arab population’s annual natural growth rate is slightly higher than that of the Jewish population: 24.6 per thousand people vs. 23.2 per thousand people. Aliyah (immigration to Israel): In 2012, 2,170 new immigrants settled in Jerusalem, constituting 13 percent of all immigrants to Israel that year. In 2012, as mentioned earlier, 19,200 residents left Jerusalem for other communities in Israel and 10,500 residents entered Jerusalem from other communities in Israel. The population balance was thus negative and stood at −8,700. This is the highest negative migration balance in the last 20 years. Migrants to and from Jerusalem are mainly Jews; only a minority are Arabs (3 percent-4 percent). For 32 years (until 2012), except for one year, the migration balance of Jerusalem was negative, and it subtracted hundreds of thousands of Jewish residents from the city! In the particularly “bad” years the negative migration balance subtracted about 8,000 residents from the city annually (1997: −7,600; 1999: −8,000; 2000: −8,200). In most of the other years since 1980, Jerusalem’s migration came to about −6,000. In all of these years, nearly all of those who left or entered were Jewish. A significantly higher birthrate among the Arab population; the trend has reversed only in recent years. Derivative of the first two factors, significantly higher natural growth, over time, for the Arab population than for the Jewish population. The gap has narrowed in recent years, and in 2012 the trend reversed. An ongoing trend of negative migration balance for the Jewish population: over the past 32 years far more Jews have left Jerusalem than moved to it. This trend is relatively new, after many years in which the trend was the opposite. The Arab population has a younger age structure; hence, more Arab women than Jewish women are at fertility age. The fact that the Jewish side has “taken the lead” from the Arab side regarding natural growth and fertility rate still does not ensure renewed growth of the Jewish majority. Even if this trend continues, it will have no impact if the Jewish population that is added to the city has nowhere to live. When it comes to the housing supply for Jerusalem’s Jewish population, the situation is not encouraging. The lack of housing, or of affordable housing, is the main factor causing large numbers of Jews to leave Jerusalem each year. These are established facts, to be discussed below. Before deciding our steps for the future, we need a forecast of the likely demographic situation in Jerusalem in the medium and long term. Based on such a forecast, one can try and pursue a policy to counter the phenomenon of large-scale departure from Jerusalem. Here we will make use of a forecast included in a study that was prepared by Prof. Sergio DellaPergola for the transportation master plan of Jerusalem. It is one of three model forecasts that were produced on the basis of different assumptions. The forecast that was chosen here takes into account the continuation of trends that have prevailed in Jerusalem in most of the recent years, namely: declining fertility, both in the Jewish13 and Arab populations, and identical migration rates to those of the preceding years. According to this forecast the proportion of Jews among the city’s population, which stands today at 63 percent (2012 data), will continue to decline; in 2020 it will come to 61 percent, and in 2030, to 58 percent. Correspondingly, the rate of Arabs among the city’s population will continue to rise. In 2020 it will reach 39 percent, and in 2030, 42 percent. A more optimistic forecast was provided by the American-Israeli Demographic Research Group headed by Bennett Zimmerman and Yoram Ettinger, but we will not deal with it in this framework and will not evaluate it here. We will just note that this different forecast is based on several assumptions and suggestions, the main one being that the decisive factor in Jerusalem’s Jewish-Arab demographic balance is migration, so that if migration trends change, so will the city’s demographic picture. We share this assumption, and will try to test it based on the forecast for the years 2020 and 2030 that Prof. DellaPergola prepared. From 1980 to 1990, Jerusalem’s migration balance was usually negative but low compared to today’s balance; on average it came to about −1,000 residents per year. From 1991 to 2012, Jerusalem’s migration balance deteriorated; in those 22 years it averaged −6,568 per year. During those years 368,300 residents left Jerusalem (an average of 16,741 annually) and 223,800 residents moved to it (an average of 10,172 annually). In terms of the demographic balance, haredi emigration from the city damages Jerusalem’s growth potential more than the emigration of other Jews. The reason is the high birthrate of haredi women, which accounts for a higher future “loss” of population. On the other hand, when a well-off population that contributes economically to the city departs, the “loss” from emigration for the general population is greater, since the haredi population has a low number of wage earners, whose income level is also low, compared to the general population. Thirty percent of the emigrants from Jerusalem in 2010-2012 left for Jewish communities in Judea and Samaria. Eighteen percent went to live in other communities in the Jerusalem area. Another 52 percent moved to various other parts of Israel. Many of those leaving – according to the editors of the Statistical Yearbook of Jerusalem, Dr. Maya Choshen and Michal Korach – are Jerusalemite young people and students, or residents who had moved to Jerusalem for academic reasons, lived in the city a number of years, and then left. A study conducted by the Jerusalem Institute for Israel Studies for the Merom Plan (a government plan for the economic development of Jerusalem in 2011-2016) examined the motives for migration from and to the city, with the aim of formulating a policy to encourage migration to the city. The study was carried out by Dr. Maya Choshen and Michal Korach. It was based on a sample of 559 households, 82 percent of which left Jerusalem from 2011 to 2013. The study found that 43 percent of the adult emigrants (not including children) were secular, 11 percent were not-so-religious traditional, 5 percent religious traditional, 17 percent religious, and 23 percent haredi. Forty-seven percent of the interviewees picked housing (and particularly its high prices) as the most important reason for leaving the city. Fifteen percent picked family and friends as the most important reason, and 14 percent picked employment (particularly, small chances of finding work in their field). Additionally, in response to the question of what was the second most important reason for leaving the city, housing (and particularly the high prices) turned up most often; 30 percent of the households chose housing as the second most important reason for leaving the city. Nineteen percent chose reasons related to quality of life as second most important, 13 percent chose reasons related to employment, and another 13 percent chose family and friends. For all three sectors – secular, religious, and haredi – housing is the most important reason for leaving Jerusalem. However, the frequency of this reason among the sectors differs greatly. Among the secular population, 28 percent of the households chose housing-related reasons as the most important for leaving; for the religious and haredi populations the corresponding figures were 60 percent and 78 percent, respectively. The second most common reason is employment – 20 percent among the secular compared to 11 percent among the religious and 4 percent among the haredim. Young people and people with a higher education form a considerable part of the emigrants. Fifty-two percent of those leaving Jerusalem are aged 25-34, 14 percent are 20-24, and 11 percent are 35-39. The haredi emigrants from the city are the youngest, with 84 percent aged 20-29. The religious and the secular populations that leave the city are older, but still mostly below 35. The high proportion of younger people among the emigrants makes Jerusalem an older city. In the process of emigration from Jerusalem, over the years the development of the city’s satellite communities – such as Maale Adumim, Efrat, Beitar Illit, Givat Ze’ev, Mevaseret Zion, and Modi’in – played a major role. The apartment prices in these satellite communities tended to be substantially lower than those in Jerusalem. Young couples who wanted to buy apartments in the city had a very hard time or were unable, especially because the supply of apartments in Jerusalem at present, especially since the cancellation of the Safdie Plan for construction in west Jerusalem, is meager. At the same time, according to the results for 2014 from the Jerusalem Institute’s study on behalf of the Merom Plan, the target city, to which the largest number of households – 17 percent – relocated, is Tel Aviv. H. The Optimistic Scenarios – What Would Happen If: Looking Backward, Looking Forward. What would have happened in the past if the city’s migration balance had been positive or even over the years? What will happen in the future if the city’s migration balance is positive or even in the coming years? Regarding the future: If one assumes that Jerusalem’s migration balance in the next 11 years, up to 2025, will be even, that is: if annually “only” about 10,000 residents (about the same number who enter the city) leave the city, instead of the current annual average of 16,741, then the city will gain a Jewish population of at least 74,150 (without calculating expected births, the overwhelming majority of them to Jews).20 An even migration balance is, of course, also attainable when the change in the extent of emigration is less dramatic – that is, if there is a corresponding increase in the number of residents who enter the city. Based on the model forecast for 2025 that was presented here, the meaning is that the weight of the Jewish population among the city’s total population will be in such a case at least 62.3 percent instead of 59.6 percent. In an even more optimistic scenario, in which the number of entrants to the city grows and exceeds the number of emigrants by as many as 2,000 people per year, the proportion of the Jewish population in the city’s total population would come to at least 64 percent in 2025. Three additional optimistic demographic scenarios could occur if steps were taken to define Jerusalem’s boundaries differently, and/or to alter the status of its residents. I. The Division Scenario – Indeed a Demographic Improvement? Jerusalem was already divided once in the past, in 1948. After the war and the city’s division, many residents left. About a third of its residents left the eastern party of the city – 28,000 people, mostly Christian Arabs. Some 25,000 people left the western part of the city, the overwhelming majority of them Jews. Some returned to the city after the security situation improved. The situation was briefly described in the first edition of The Dangers of Division, published in 2008, and Nurit Cohen-Levinovsky has now greatly elaborated on the subject in her book Jewish Refugees in the War of Independence.22 A redivision today will turn many of the neighborhoods along the present seam line into border neighborhoods, which will then be very likely to suffer from terror attacks, shooting attempts, thefts, and rapid decline in property values. (See the description in Chapter 3 of this book.) A foreshadowing of such a situation emerged during the “Jerusalem Intifada” of July to November 2014 in Pisgat Ze’ev, which was imperiled by several shooting incidents from the direction of the Shuafat refugee camp.23 At the beginning of the 2000s, many residents of the Gilo neighborhood had to leave their homes under fire from the nearby Beit Jalla neighborhood. According to the existing tendency,24 in the neighborhoods that were established in Jerusalem north, south, and east of the old, pre-1967 jurisdictional zone, a separation from the adjacent Arab neighborhoods, and the transformation of these Jewish neighborhoods into border neighborhoods, will likely prompt Jews to move from them to neighborhoods “farther” from the new boundary, in the west of the city, similar to the process that occurred in Jerusalem in 1948. Given the insufficient supply of residential apartments in Jerusalem and the increasing cost of housing in the city, many of these people will leave Jerusalem for the periphery or places farther away. In other words, what is entailed is the possible departure from Jerusalem of tens of thousands of residents (for more on this possibility, see Chapter 3). Thus, removing the Arab neighborhoods from the city will likely foster a demographic process on the Jewish side that is the opposite of what is wanted: on the one hand, the departure of tens of thousands of Jews from what will now be border neighborhoods, as occurred in 1948, and on the other, the influx of tens of thousands of Arabs to the Israeli side of the fence, as already occurred with the building of the separation fence in the early 2000s. These two processes are likely to be of much greater magnitude, however, because of the current size of the respective populations: about half a million Jews and about 300,000 Arabs. J. What Is to Be Done? How Does One Keep Jews in Jerusalem and Improve the Migration Balance? Changing the existing demographic trend to the point of reversing it, or at least until the Jewish population’s migration balance is even, is possible only through deep governmental involvement on the main issues that cause residents to leave the city: housing and employment. How Jerusalem can be bolstered is not a secret. Most of the measures required are already known: Jerusalem has to be designated a priority location of the highest rank, and this must be translated into the language of action. Often the Israeli government has concerned itself with Jerusalem’s status as a capital but neglected it as a city, failing to understand that its strength as a capital derives from its strength as a city. In recent years about 2,000 new apartments (the overwhelming majority of them for Jews) have been built in the city annually, while the Jewish population’s demand for new apartments has stood at 4,000-5,000.27 The building and populating of another approximately 2,000 apartments per year would add to the city annually a population of 8,00028 (the overwhelming majority of them Jews), and Jerusalem’s migration balance would then be even – that is, an equal number of people leaving and entering. For many years, though, that aspiration has only been a fond wish. Over the past ten years – 2004-2013 – a total of only 18,967 apartments were completed in Jerusalem,29 an average of about 1,900 per year (see the table below). If, in that period, another 2,000 housing units had been built each year, supply would have matched demand and 20,000 units would have been added, with approximately 80,000 people living in them. Such a scenario would alter the Jewish-Arab demographic ratio in Jerusalem, bringing it, already today, to about 600,000 Jews vs. about 300,000 Arabs (or 67 percent Jews vs. 33 percent Arabs). Among the factors that kept those numbers low, leaving supply at only about 50 percent of demand, was the cancellation of the Safdie Plan in southwestern Jerusalem. It was intended to add about 12,000 housing units to the city (for an estimated population addition of about 50,000), but was dropped because of green organizations’ opposition. The data for completed apartments in Jerusalem over the past decade are also low because of the many delays in planning, and in implementation of construction plans, beyond the Green Line in the Shuafat Ridge, Givat Hamatos, Har Homa, and also in Gilo, Pisgat Ze’ev, and Ramot. It was, of course, political pressures, mainly from the United States, that greatly slowed and sometimes froze these building plans. The year 2012 well illustrates the de facto construction freeze in Jerusalem beyond the Green Line. Central Bureau of Statistics data show that only 43 housing units were added for Jews in neighborhoods over the Green Line.31 The data revealed something else as well: that though the wheels of the planning committees may have been turning, actual construction was frozen. For example, in 2009-2011 permits were granted to build 8,460 housing units for Jews over the Green Line, but the overwhelming majority of them remained on paper. In 2010 only 73 housing units were added over the Green Line, and in 2011, 705.32 Two building plans that were long delayed for political reasons were a plan to build 1,500 housing units in the Ramat Shlomo neighborhood and a plan to build 700 units in Pisgat Ze’ev. A similar fate befell plans to build 2,000 housing units in Gilo and 2,600 in Givat Hamatos. The large construction plan (2,500 housing units) for the E1 area between Maale Adumim and Jerusalem has also been delayed for many years out of political considerations. Over the years, a competitive market of “apartments in the periphery” of Jerusalem emerged. These are significantly cheaper and have attracted young couples and many Jerusalem families. In the haredi sector many families have moved to the haredi towns of Beitar, Modi’in Illit, Beit Shemesh and Bnei Brak. In the secular sector many families have moved to the areas of Mevaseret Zion, Maale Adumim, Modi’in, Tzur Hadassah, and Tel Aviv.33 To a considerable extent, the success of this competing market over the years stemmed from the lack of cheap competition, or of sufficient supply of apartments, in Jerusalem. There has been a concordance between the supply of apartments in the periphery and the numbers of those leaving Jerusalem. In years in which there were fewer housing starts in the periphery, fewer people left Jerusalem. In years in which there were more abundant housing starts in the periphery, more people left Jerusalem. This pertains especially to the haredi population. For example, in years in which about 500 housing units were built in Beitar, a larger haredi population left Jerusalem. In recent years, however, due to political pressures there has been less building in Beitar, which is over the Green Line, and likewise fewer haredim have been leaving Jerusalem. Jerusalem’s negative migration balance does not only stem from emigration caused by a lack of housing. Also contributing to the phenomenon is a low rate of implementation of governmental decisions that were supposed to counter this trend. A study conducted about a decade ago by Reuven Merhav and Guy Galili of the Jerusalem Institute for Israel Studies34 shows a certain extent of government involvement in various issues related to Jerusalem. From 1975 to 2005 Israeli governments took 330 decisions on matters related to the capital. The two most active domains were “decisions on the status of the city” – 97 decisions, a considerable part of which had practical implications and included directives to transfer budgets for clear-cut purposes; and the area of development, land, building, and benefits, where 122 decisions were taken. Dozens of decisions and recommendations of great importance, which were not implemented, concerned a slew of benefits for the population or for entrepreneurs. These were aimed at making residences, enterprises, and construction in Jerusalem cheaper, more profitable, or more attractive. The government that remained in Tel Aviv: The most notable example of decisions of this kind that were not implemented concerns the transfer of government ministries, government companies, and other public bodies to Jerusalem. This decision affects, of course, Jerusalem’s status as the capital, but it also stems from the desire to further increase the city’s Jewish population. In January 1977 the Israeli government headed by Yitzhak Rabin decided to transfer to Jerusalem the national units of the government ministries that had not yet moved there. The Begin government (1981), too, took a series of decisions on this issue. Among other things, an official in the Finance Ministry was appointed to deal with evacuating buildings at the Givat Ram campus of the Hebrew University of Jerusalem, which were to be designated for departments of the Defense Ministry. The Begin government even prohibited building additional major governmental departments outside of Jerusalem. In 1983 and in 1985 similar decisions were taken. Later governments also took decisions of this kind, some of them quite detailed. The Sharon government went further and on July 24, 2004, decided that every official gathering initiated by government ministries or government companies had to be held in Jerusalem. In 2005 the government officially recorded the defense minister’s announcement that his ministry intended to transfer the military colleges, including the National Security College, the Command and Staff College, and the Tactical Command College, to Jerusalem. Only a few of these decisions were implemented. As of 2008, the national units of the government ministries still located in Tel Aviv and the central district took up 86,375 square meters.35 According to a common calculation of 20-25 square meters per worker, this would add up to 3,800 workers, most of whom had families.36 This reality had not changed by 2015. Thousands of additional workers, both in the southern and northern parts of the country, as well as national units related to the Defense Ministry and the Israel Defense Forces, are still located outside of Jerusalem. In his report (A64) for 2013, the state comptroller again reviewed the implementation of the 2007 government decision on “transferring national units of the government to the capital.” This decision stipulated that the national units of the government ministries, including independent administrative units, would gradually be transferred to the municipal area of Jerusalem within eight years from the day the decision was taken. Exceptions were made for the Defense Ministry and units of the Prime Minister’s Office. The comptroller’s findings show to what extent this was a decision only on paper. Even before the comptroller’s inquiry, members of the Awakening in Jerusalem organization had requisitioned a professional survey from the economic consulting office Uri Dahan Ltd.; their aim was to examine some government units that were supposed to move to Jerusalem but had not done so. This inquiry was conducted in November 2012, and it, too, discovered that at that time more than 80 government units continued to operate outside of Jerusalem. This included over 1,000 workers of the Ministry of Economy, who were subordinate to Minister of Economy Naftali Bennett. Then a new minister, his field of responsibility also included Jerusalem affairs and thus another 732 employees of the Prime Minister’s Office, the body responsible for implementing the decision. In May 2014 the government extended by three years – to 2019 – the date for completing the plan to transfer all the government ministries to Jerusalem. The Ministry of Jerusalem Affairs was given responsibility for implementing the plan, and was requested to report to the government on its progress. After perusing much material on this subject over the years, the inevitable impression is that most of the decisions on transferring ministries to Jerusalem lack teeth or any significant mechanism for enforcement. It often turns out that the precondition for moving a ministry or unit to Jerusalem is that the employees be allowed to continue living outside the capital, with funding for commuting arrangements. How theoretical the decisions on this matter were is evident from the actual, meager number of workers affected. It recently turned out, for example, that the Religious Affairs Ministry had managed to transfer a total of three! They were employees of the rabbinate who dealt with Ethiopian Jews in Jerusalem. Low grants: The government took a series of decisions that were intended to benefit apartment buyers, offering grants, discounts, subsidies, and comfortable mortgages. The aim was to attract population to Jerusalem. These decisions were only implemented for a limited time, or sometimes not at all. Mostly the sums offered were low and did not suffice to make living in the city worthwhile, cheaper, or as cheap as living in the periphery. For example, on May 13, 2001, the government decided to offer a sum of 40,000 shekels to hi-tech workers in Jerusalem enterprises, who were living outside of Jerusalem, for purchasing a new or secondhand apartment in the city. This decision only had a minor effect. The end of expropriations: It was in 1995 that, for the last time, an Israeli finance minister signed orders to expropriate lands for the needs of the population in Jerusalem, according to the articles of the law that permits doing so. Amid a resulting international uproar and pressure from the United States, this decision, which was supposed to enable building in the area of Beit Safafa, Ramot, and Beit Hanina, was rescinded. Expropriations had served the state of Israel for half a century. In Jerusalem, they had enabled the building of the string of Jewish neighborhoods to the east, west, and north of the old jurisdictional boundaries. The government has contingency plans for further expropriations, pending political feasibility and a government decision to implement them. Carrying out expropriations in additional areas within Jerusalem’s jurisdictional boundaries near Har Homa, for example, would provide additional land for the building of thousands of housing units. Outlines for action: Many other decisions, mainly in the economic domain, were not implemented or not fully implemented. Only the more significant ones are noted here. Changing the demographic processes of Jerusalem requires large-scale funding. Fulfilling the order of priorities that the Israeli government has so often declared and putting Jerusalem at the top of those priorities, means going beyond lip service to action. Below is an enumeration of decisions and action plans that accumulated in reports prepared by different parties.42 The goal of all of them: to attract population to the city. It should be noted that these are merely outlines, which need to be fleshed out and implemented in line with the recommendations of professionals. Low tax rates: Instituting significantly low tax rates for new startup companies in Jerusalem and its surroundings, and on existing science and technology companies in Jerusalem and its surroundings. Free land: Rezoning plots of free land for the development of new technological parks such as those in Har Hotzvim and Malcha. Integrating the haredim: Encouraging technological and scientific employment in the haredi sector, while enabling an approach that combines Torah and work, with the aim of considerably raising the number of Jerusalem haredim in the workforce. The Jerusalem municipality and the Jerusalem Development Authority have already been dealing with this for a few years. Subsidies for students: Providing subsidies to those entitled, according to criteria, to buy or rent apartments in the city. The Jerusalem municipality and the Jerusalem Development Authority have succeeded in this way, with government assistance, to attract thousands of students who have rented apartments in the city. Hi-tech: Continuing and increasing government support for hi-tech industries in Jerusalem, such as developing industrial zones or training and retraining manpower, including workers from the haredi sector. In recent years government support has facilitated the creation of thousands of positions in the hi-tech field in Jerusalem. Railway: Completing the upgrade of the Tel Aviv-Jerusalem rail line. Clearing and building: Implementing decisions to renew Jerusalem neighborhoods that were intended to increase land use twofold or threefold; adding to the neighborhoods, and their residents, a high-socioeconomic population while improving the quality of housing for the new residents. Among the measures entailed: a tax exemption for the replacement process. The municipality will require the entrepreneur to tend to the infrastructures and the public buildings in return for an exemption or discounts on levies, fees, or any other requirements; the process of securing building permits will be accelerated; the agreement of the Israel Lands Authority will be obtained on not requiring receipts from the rehabilitation. In June 2014 the government decided to allocate a total of 30 million shekels to promote projects of clearing and building during 2017-2020. Among other things, it was agreed that the aid provided to the contractor for each housing unit to be evacuated would not exceed 80,000 shekels per unit, and that the conditions for receiving the aid would be determined by the Housing Ministry with the approval of the Finance Ministry. Also at that time, the government officially recorded the decision of the Jerusalem City Council to recommend granting an exemption from the capital-gains levy, for a limited time and subject to conditions that were determined for transactions carried out in the context of the urban renewal. Grants: Increasing the grants for students who decide to attend university in the city and live in it for a substantial time. Industry out, dwellings in: The 2000 Outline Plan was a detailed plan that, if just a few of its recommendations had been implemented, would have brought about a different city. The recommendations of the team, which was headed by Moshe Cohen and included some of the top professionals in Israel, were published in a comprehensive 500-page report. We will briefly mention some of them: evacuating industrial facilities from central areas of Jerusalem, such as Givat Shaul and Talpiot, to free them for residence, and transferring industries from these areas to more distant areas within the city or adjacent to it; transferring the Faculty of Agriculture of the Hebrew University from Rehovot to Jerusalem; implementing plans to integrate the haredi population into higher education; and developing an “employment enclave” in areas that are highly accessible to most of the residential areas of the western part of the city, and also are close to its research and higher-education institutions. This cluster would include, among others: startup companies, manufacturing companies, higher-education institutions, and hospitals that engage in research. The areas that would form the proposed employment cluster are: Givat Ram and Kiryat Haleum, Tsomet Beit, and Pri Har Valley, in addition to development along Road 16 and an increase of activity in Malcha. Preferred profession: Developing targeted assistance plans to encourage those same population elements to remain in Jerusalem, and, in this context, defining what groups constitute preferred professionals. 20 million tourists: Massively expanding the city’s potential for hoteliery and vacationing as a way to substantially increase the number of tourists who come to it. This will also create numerous additional jobs in the city. Although Jerusalem is a tourist haven for historical and religious reasons, the state is squandering this enormous potential and settling for what already exists. A plan to fully utilize Jerusalem’s tourism potential was prepared, for example, by Tourism Ministry officials. Jerusalem Mayor Nir Barkat has also put this matter at the top of his concerns. In recent years the Jerusalem Affairs Ministry has begun to deal with it as well. Today about 2.5 million tourists visit Jerusalem annually, constituting about 85 percent of the tourists who visit Israel. Although the target set for 2030 was no less than 20 million tourists per year in Jerusalem, Jerusalem is not prepared in terms of infrastructure for such a large number. For example, according to an assessment by a transportation consultant, six million tourists per year would already cause traffic blockages in the city. Over the past two years a professional team in the Jerusalem Affairs Ministry has been tasked with examining, in coordination with the Tourism Ministry and the Jerusalem municipality, all the elements required for a substantial increase of tourism to Jerusalem – and thus to Israel as well. The aim of this project is to realize Jerusalem’s enormous tourism potential and create the full infrastructures needed for additional millions of tourists. These infrastructures include tourist-friendly transportation,43 attractions for different target populations, the development of key tourist sites, the development of tour routes, a “smart city,” and the harnessing of technology to develop the world of tourism, hoteliery, and the like. In the framework of the Merom Plan, in May 2011 the government allocated about 225 million shekels to encourage initiatives aimed at increasing tourism in Jerusalem. As of the end of 2013 there were 14,797 accommodation rooms in Jerusalem. Of these 10,814 were hotel rooms, 1,685 were hostel rooms, and 2,298 were accommodation rooms and apartments for rental to tourists; in the city there are land reserves and approved plans for building thousands of additional rooms in new hotels. The delays in building them stem, for the most part, from economic problems of entrepreneurs, from various demands that they present to the planning authorities, and from governmental bureaucracy, such as excessive strictness regarding physical regulations, delays in allocating land, and in issuing tenders. Until the Six-Day War, Jerusalem played the role of a border town. Its relatively limited municipal territory and location influenced its weight from an economic and social standpoint. Over time, the enlargement of Jerusalem, the annexation of considerable lands to its domain, and extensive building and development in these lands turned Jerusalem into an expansive metropolis. Functional analyses that were done in the past found that the space surrounding the city functions as a single space of choice for most of the population that lives in it, which maintains numerous links to the city. Measurements of commuting in past years have well reflected this reality.46 Thus the need emerged to establish a framework that would concentrate, manage, and coordinate what occurs in the metropolitan space of Jerusalem under a single umbrella. Many discussions have been held on this matter over the years. Today the links between the Arab population in the space surrounding Jerusalem and the city itself have weakened considerably. The reasons are political and security-related. De facto, the building of the fence on the route surrounding Jerusalem cut off many living in the city’s circumference from the city. Some migrated back into Jerusalem, but many more find other alternatives such as Ramallah to the north or other population concentrations in the south, most of them within the Palestinian Authority. At the same time, the Jewish population in the metropolis, which has no security restrictions on entering Jerusalem, continues to maintain numerous links to the city – economic, social, and family-related. This pertains, among others, to communities such as Maale Adumim to the east, Givat Ze’ev to the north, Beitar Illit to the southeast, Efrat in Gush Etzion to the south, or Mevaseret Zion to the west. All these communities and many others are included in metropolitan Jerusalem as outlined in the past by government teams, and they number at least 120,000 people (not including Beit Shemesh), the overwhelming majority of them Jews. The possibility that this population will actually become part of Jerusalem, and be included in the count of its residents, has arisen in discussions on establishing an umbrella municipality for Jerusalem. In the period of the second Rabin government and the first Netanyahu government, the issue was examined and a positive decision was taken, but it was not implemented. If it had been implemented, communities such as Maale Adumim and Efrat would have functioned as sort of subordinate neighborhoods under a common umbrella municipality for Jerusalem and the surrounding communities, headed by the mayor of Jerusalem. This apparently required an administrative step, since it did not entail expanding Jerusalem’s jurisdictional zones or applying Israeli sovereignty to the areas beyond the Green Line within the umbrella municipality. Such an administrative step, however, would greatly affect the demographic picture by bringing into the domain of the city, or the domain of its administration, an additional 120,000 Jewish residents.47 This indeed entails a kind of regional government, which, if established, could be given a national status, so that all of its territory and population would enjoy the benefits related to Jerusalem as the capital. A report aimed at strengthening Jerusalem, which was submitted to the prime minister in June 1998, proposed establishing an umbrella municipality whose core would consist of the Jerusalem municipality. The report specified that, within the framework of the umbrella municipality, each local authority would be able to function as an autonomous framework and retain its uniqueness, while the government ministries, mainly on the district level, would have to delegate powers to the umbrella municipality. As the report put it: “In the new structure the government ministries will have to settle for determining an overall policy and including the umbrella municipality in all discussions, as is done when working with the district offices and administrations.” Another report, “Strengthening Jerusalem,” which was submitted by the Jerusalem municipality to government ministers in May 1998, presented an overall conception that included an outline for implementation of an “Umbrella Municipality Law – Jerusalem Surroundings.” Among other things, the report proposed creating a central planning bureau for the Jerusalem-area communities that would deal with common planning issues and also would allocate an annual budget to the umbrella municipality from government sources. A committee of directors-general headed by the director-general of the Prime Minister’s Office was supposed to formulate recommendations, mainly dealing with the transfer of the powers held by the government ministries at the district level to the umbrella municipality, as well as coordination with the Defense Ministry, particularly in the area of planning and building. A professional committee headed by the director-general of the Interior Ministry was supposed to formulate recommendations on the structure of the umbrella municipality. This plan – which would have presaged a new demographic reality for Jerusalem – was not implemented mainly for political reasons, with the United States opposing measures that could be interpreted as creating facts affecting the future of Jerusalem before negotiations between the sides. As of now, the plan has not been put in practice and remains a concept. In the years 2002-2003, Jerusalem suffered greatly from terror attacks. Twenty-two suicide bombings occurred in the city, and 130 citizens were killed. From 2004, and particularly from 2005 onward, suicide bombings in the city declined, among other things because the terror organizations were hit hard in Operation Defensive Shield. The terror onslaught and the intifada, however, led to the building of the separation fence along Jerusalem’s circumference. The fence was intended to stymie the suicide bombers and terror attacks in general. Officially these areas remained parts of Jerusalem under Israeli sovereignty, and those living in them continued to be Jerusalem residents. In practice, however, these areas ceased to be part of Jerusalem’s urban fabric. Any entry by residents to the “Israeli side” of the fence entails crossing a checkpoint. The Israeli authorities mostly steer clear of these neighborhoods, which suffer from ongoing government neglect and from poor, if any, municipal services. These neighborhoods…where, according to estimates, about 100,000 people live (some of them apparently residents of the territories), have become a “no-man’s-land” where law and government do not operate and the municipal services are almost nonexistent. In these neighborhoods dozens of unapproved multistory buildings have been built that house thousands of residents, including numerous young couples and families that bought apartments at relatively low prices. The construction, which lacks the necessary infrastructure, makes the buildings severe safety hazards, for example, in case of an earthquake. At present the Jerusalem municipality has no role in administering these neighborhoods, and it is incapable of dealing with the complex situation in which about 55,000 of their residents now find themselves. The state of Israel has given in. They are outside the scope of the state of Israel and certainly of the municipality. In any practical sense – this is Ramallah…. Apart from the right wing and those who are semi-hallucinatory, I do not know anyone who wants to apply Israeli sovereignty to these areas. During the “Jerusalem Intifada” as well, it became clear to what extent the residents of these areas were cut off from Jerusalem. This emerged particularly regarding the residents of Shuafat, who played a central role in the disturbances that followed the murder of the teenage boy Muhammad Abu Khdeir by Jewish extremists in July 2014. Several times shots were fired at Pisgat Ze’ev from the camp, and the situation there was described as the “Wild East” and a “no-man’s-land,” even though some Israeli security forces were present there. Israel will not lose sovereignty over these areas, which are formally part of the state of Israel. Israel will continue to be in charge of security in these areas and will maintain both a security and an intelligence presence in them. The Jerusalem municipality will free itself from an economic burden that it already could not bear even before the building of the fence. The residents will gain a regional council with an Arab council head and local council members, which will be budgeted by the state of Israel like every other council. They will be able to improve their situation considerably; to set orders of priority; to invest much more in infrastructures and services, two areas that have been almost totally neglected in these areas; and most of all, to conduct their affairs by themselves, subject to Israeli law and regulations. They also will retain their resident status. Demographically, such a step will mean a large demographic rebalance for the Jewish side in Jerusalem. When these areas are officially separated from the city, only 220,000 Arabs will be left in it, forming only about 30 percent of the population compared to almost 40 percent at present. This will enable Israel to invest more in the Arab neighborhoods that remain in Jerusalem, in an attempt to reduce the gaps in infrastructures and services between them and the Jewish neighborhoods. It is expected that the residents, and particularly the political and national activists in these areas, will initially show opposition to the idea. This, however, can be overcome by setting up a council with an appointed head, as is sometimes done in Jewish local and regional authorities. The workers to be employed by this council will of course be Arabs from among the residents of the neighborhoods that have remained beyond the fence. Those living in east Jerusalem hold resident cards that afford them many benefits.51 At present it is very easy to lose this status. It is revoked from anyone who has lived outside of Jerusalem seven years or more. In the mid-1990s the Interior Ministry energetically revoked resident cards from east Jerusalem Arabs who had gone to live in locations outside of the city (in the West Bank or abroad). Since 1967 about 14,000 people have had their resident status revoked. This has contributed to the phenomenon where many of those who hold a resident card and live outside Jerusalem move into Jerusalem for fear of losing the rights and benefits. 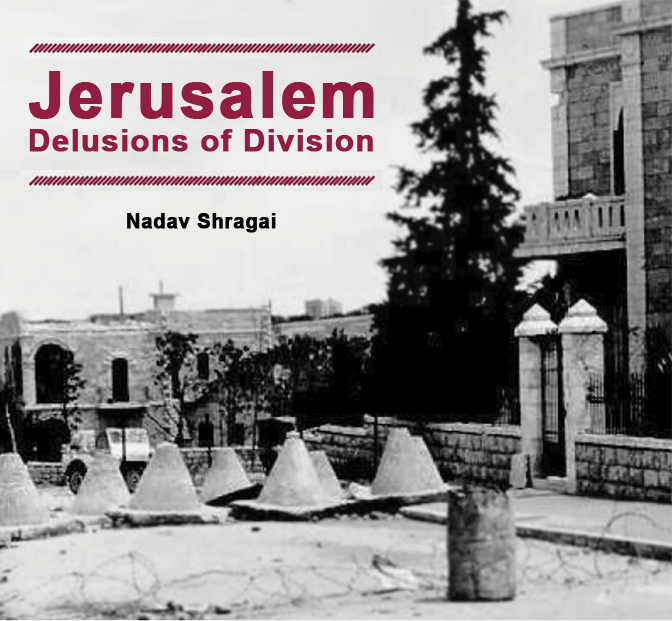 1 For more on this subject, see Nadav Shragai, Tichnun, Demografia, v’Geopolitika b’Yerushalayim (Planning, Demography, and Geopolitics in Jerusalem) (Jerusalem: Jerusalem Center for Public Affairs, 2010), 10-11. 2 Ora Ahimeir and Yaacov Bar-Siman-Tov, eds., 40 Shana b’Yerushalayim (40 Years in Jerusalem) (Jerusalem: Jerusalem Institute for Israel Studies), cited in the report by Maya Choshen and Michal Korach. 3 David Kreunker, Yerushalayim: Hamaavak al Mivne Ha’ir v’Chazuta (Jerusalem: The Struggle over the Structure of the City and Its Appearance) (Tel Aviv: Zamora Bitan, 1988), 58. 4 The demographic target was updated in the framework of the 2000 Outline Plan, the local outline plan for Jerusalem, which was delegated to the District Committee in 2009. This target was also adopted by the outline plan for the district. For more on the process of the revision of the demographic target by the planning institutions, see Shragai, Tichnun, Demografia, 9. 5 Most of the data were taken from Maya Choshen and Michal Korach, eds., Al Netuneich: Yerushalayim 2014, Matzav Kayam v’Megamot Shinui (Jerusalem: Facts and Trends 2014), which is based on Maya Choshen and Michal Korach, eds., Hashnaton Hastatisti shel Yerushalim (Statistical Yearbook of Jerusalem) (Jerusalem: Jerusalem Institute for Israel Studies/Jerusalem Municipality, 2014). Most of the data in both books are based, in turn, on findings of the Central Bureau of Statistics. 6 Source: Jerusalem Institute for Israel Studies, based on the Central Bureau of Statistics. 7 Choshen and Korach, Al Netuneich. 8 The data are based on Choshen and Korach, Hashnaton Hastatisti. The yearbook’s data are based on different sources, principally the Central Bureau of Statistics, the Jerusalem municipality, and Choshen and Korach, Al Netuneich. 9 Although the haredi fertility rate is higher, the Arab age structure is young because of the Arabs’ historically higher fertility rates. 10 Some of the information in this chapter is taken from Shragai, Tichnun, Demografia. 11 Up to the second half of the 1970s, the Arab population’s mortality rate was higher than that of the Jewish population. With the development and improvement of health services in Jerusalem, however, the trend changed to the point that it reversed. 12 This forecast was prepared at the beginning of the 2000s by Prof. Sergio DellaPergola for the master plan for transportation in Jerusalem. Prof. DellaPergola also prepared similar forecasts for the strategic master plan of the Jerusalem municipality and for the team that prepared the Jerusalem Outline Plan. At present the Jerusalem Institute for Israel Studies is preparing an updated population forecast for Jerusalem in the years 2030 and 2040, in the framework of the master plan for transportation in Jerusalem. The work is in its early stages, and it is not yet possible to formulate a picture of trends and directions. Hence, for my analysis I relied on the existing forecast of Prof. DellaPergola, which has proved itself as more or less conforming to reality at many points over the years. 14 In December 2014 I talked with Prof. DellaPergola. He adhered to the model he had developed, noting that at many points in time there was agreement between the forecast and the actual data. 15 Israel Kimchi, Binyamin Heiman, and Claude Gabriel, Hashnaton Hastatisti, 1967-1975 (Jerusalem: Jerusalem Institute for Israel Studies/Jerusalem Municipality); Skira Hevratit Statistit (Statistical Social Survey). 16 Yair Asaf Shapira, “Netunim Statisti’im: Ha’ir b’Misparim” (Statistical Data: The City in Numbers), website of Jerusalem Institute for Israel Studies. Shapira explains that most people who relocate do so at significant junctures of life: marriage, birth, or children entering first grade. 17 Choshen and Korach, Al Netuneich. 18 For more on the findings of this study, see Maya Choshen and Michal Korach, Tochnit Merom: Livui, Pituach Yeda, Maakav, Haaracha, v’Mechkar 2014 (The Merom Plan: Observation, Development of Knowledge, Follow-up, Evaluation, and Research 2014) (Jerusalem: Jerusalem Institute for Israel Studies/Jerusalem Development Authority/Ministry of Jerusalem and Diaspora Affairs, 2014). Quite similar findings emerged from other studies in the past, including Sarah Hershkowitz and Sarit Fremont Rafiach, Hahagira m’Yerushalayim 1996 (Emigration from Jerusalem 1996) and Hahagira m’Yerushalayim 1998 (Emigration from Jerusalem 1998) (Division of Strategic Planning and Research); a previous study by the Jerusalem Institute for Israel Studies, which sampled close to 1,300 households that had left Jerusalem from 1993 to 1997 and found, as well, that a high rate – 42% – had chosen housing as the reason for leaving the city; Zarkur, a bulletin on this topic issued by the Knesset Research and Information Center in cooperation with the Jerusalem Institute for Israel Studies, May 2003. 19 See the reference to the decision on p. 202 of Tochnit Meta’er Mekomit Yerushalayim Doch Mis. 4 (Local Outline Plan Jerusalem 2000, Report No. 4), which was prepared for the Jerusalem municipality. 20 The larger the number of secular people who leave the city and the larger the number of haredim who move to it, the more that natural growth will increase even further; I have used, however, a minimum estimate. 21 Those who leave for the communities within the umbrella municipality, however, would still be included in the count. 22 Nurit Cohen-Levinovsky, Plitim Yehudi’im b’Milchemet Haatzma’ut (Jewish Refugees in the War of Independence) (Tel Aviv: Am Oved, 2014), ch. 4, 137-170. 23 Conversations with residents during my work as a journalist for Israel Hayom in the relevant period. 24 Based on the author’s conversations with heads and members of the community administrations in these neighborhoods, on impressions gained from newspaper articles, and on the assessment of Dr. Israel Kimchi of the Jerusalem Institute for Israel Studies in his study, Hipardut m’Shkunot Arviot b’Yerushalim (Separation from Arab Neighborhoods in Jerusalem), draft of a background paper for the Annapolis Conference. 25 For more on the fence’s ramifications for Jerusalem, see Israel Kimchi, Geder Habitachon b’Yerushalayim: Hashlachot al Ha’ir v’Toshveiha (The Security Fence in Jerusalem: Ramifications for the City and Its Residents) (Jerusalem: Jerusalem Institute for Israel Studies, 2006). Estimates of the number of Arabs who migrated to Jerusalem after the building of the fence come to about 50,000; however, there is no reliable or proven datum. 26 Yitzhak Reiter, Nasser Abu Leil, Israel Kimchi, and Lior Lehrs, Hashkunot Haarviot b’Mizrach Yerushalayim: Mechkar Tashtit v’Haaracha – Beit Hanina (The Arab Neighborhoods of East Jerusalem: Research and Evaluation – Beit Hanina) (Jerusalem: Jerusalem Institute for Israel Studies, 2014), 16. 27 Data of the Ministry of Construction and Housing. 28 According to a minimal calculation of an average of four people per apartment. 31 Tzipi Malkub and Roi Yanovksy, “2012: Rak 43 Dirot Me’ever Lakav Hayarok” (2012: Only 43 Apartments over the Green Line), Yediot Yerushalayim, May 31, 2013, 6. 33 Choshen and Korach, Al Netuneich. 34 Guy Galili and Reuven Merhav, Hachlatot Memshala b’Noseh Yerushalayim (Government Decisions on the Jerusalem Issue), in Ahimeir and Bar-Siman-Tov, 40 Shana b’Yerushalayim, 403. See also an article about this study: Nadav Shragai, “V’Shuv Matzbi’im Yerushalayim” (And Again They Vote Jerusalem), Haaretz, December 5, 2007. 35 Letter from Nir Berlowitz, supervisor of government housing in the Tel Aviv and central district, to Amos Ben Shaul, director of the Government Housing Administration, June 21, 2007, on the issue of “Haavarat Hayechidot Haartziot b’Mechoz Tel Aviv v’Hamercaz shel Hamemshala l’Yerushalayim” (Transferring the National Units of the Government in the Tel Aviv and Central District to Jerusalem). 36 According to the letter cited in n. 35, involved here were national units of the Interior Ministry, the Prime Minister’s Office, the Communication Ministry, the Water Commission, the National Infrastructures Ministry, the Transportation Ministry, the Health Ministry, the Environmental Protection Ministry, the Income Tax Authority, the Industry and Trade Ministry, the Value-Added Tax Authority, Educational Television, the Civil Service Commission, the Internal Security Ministry, the Israel Land Authority, and the State Comptroller. 37 The minister of Negev and Galilee development had a bureau in Jerusalem because of his role as national infrastructures minister. 38 Annual Report of the State Comptroller (A64), 2013, Part 2, 95-120, “Isum Hachlatat Hamemshala b’Noseh Maavar Hayechidot Haartziot shel Hamemshala Labira” (Implementation of the Government Decision on the Transfer of the National Units of the Government to the Capital). 39 During a discussion at the Prime Minister’s Office in February 2008, it was agreed that the government would again put the Safdie Plan on the agenda and try to persuade the Jerusalem municipality, which had opposed it, of its necessity. 40 See, e.g., the appraiser Levi Yitzhak to Makor Rishon, October 18, 2007: “The apartment prices in Jerusalem have gone up 20%”; Eliezer Levin, “Mechirei Hadirot Mezankim: 49% b’Yerushalayim” (Apartment Prices Are Skyrocketing: 49% in Jerusalem), NFC (News First Class) website, December 16, 2007; “Mechirei Hadirot b’Yerushalayim Alu pi 5 m’b’Tel Aviv” (The Apartment Prices in Jerusalem Rose 5 Times More than in Tel Aviv), Ynet, October 21, 2007; on Shikun, Binui, v’Maazan Hahagira b’Yerushalayim (Housing, Construction, and the Migration Balance in Jerusalem), see the report of that name from January 28, 2008, which was authored by the Knesset Research and Information Center and submitted to the Economics Committee of the Knesset; on the rise in Jerusalem housing prices over the past decade, see also Choshen and Korach, Al Netuneich, 71-72; for more on the reasons for the paucity of construction for residence in Jerusalem, see Roi Yanovsky’s interview of the chairman of the Contractors Organization in Jerusalem, Shmuel Levy, in Yediot Yerushalayim, March 21, 2014, 18. 41 See, e.g., Roi Yanovsky, “Hamehozit Bodeket: Bitul Mizam Mei Naftoach” (The District Looks into It: Cancellation of the Mei Naftoach Initiative), Yediot Yerushalayim, March 21, 2014, 12. 42 See, e.g., Lechazek et Yerushalayim (To Strengthen Jerusalem), a 70-page report that the Jerusalem municipality submitted to the Prime Minister’s Office; the recommendations of the Committee for Strengthening Jerusalem, which were submitted to the prime minister on June 18, 1998, by the team headed by the then director-general of the Prime Minister’s Office, Moshe Leon; the recommendations included in the 2000 Outline Plan, which was prepared by the team headed by Moshe Cohen; position papers of the Jerusalem Institute for Israel Studies over the years, which propose a series of measures for reducing emigration from Jerusalem; a plan of the Movement for Strengthening Jerusalem that was submitted to Prime Minister Olmert in 2008; Galili and Merhav, Hachlatot Memshala, 403-422. 43 “Tourist-friendly” transportation can help increase tourism in Jerusalem. At the same time, public transportation in Jerusalem generally must be improved. It is a source of numerous complaints, detracts from the residents’ quality of life, and is one of the factors contributing to high emigration rates. 44 Israel Kimchi, Omri Gaster, Omer Yaniv, and Lior Regev, Tavchinim l’Medidat Matzav Hatayarut b’Yerushalayim (Criteria for Measuring the Tourism Situation in Jerusalem), prepared in the framework of the Merom Plan (Jerusalem: Jerusalem Institute for Israel Studies/Jerusalem Development Authority/Ministry of Jerusalem Affairs, 2014), 5. 45 For more, see Maya Choshen, Yair Asaf-Shapira, Eitan Blauer, Inbal Doro, and Yael Israeli, Haskala Gevoha b’Yerushalayim: Tmunat Matzav, Tavchinim Kamuti’im (Higher Education in Jerusalem: Existing Reality, Quantitative Criteria) (prepared in the framework of the Merom Plan) (Jerusalem: Jerusalem Institute for Israel Studies/Jerusalem Development Authority/Ministry of Jerusalem Affairs, 2014). 46 For more, see the report: Metropolin Yerushalayim: Tochnit Av v’Pituach (Jerusalem Metropolis: Master Plan and Development), prepared for the Interior Ministry, the Housing Ministry, the Israel Land Authority, and the Municipality of Jerusalem (Jerusalem, 1994). The research and planning team was headed by Shmaryahu Cohen and Adam Mazor with the cooperation of the Jerusalem Institute for Israel Studies. 47 Excluding the population of Beit Shemesh. 48 Chizuka shel Yerushalayim: Doch Status v’Hemshech Tipul (The Strengthening of Jerusalem: A Report on Status and the Continuation of Policy), April 15, 2001, submitted to the government by the Jerusalem municipality. 49 The data are based on a report by Ir Amim from April 2014: Pitaron Medini b’Yerushalayim: Efshari b’Mechir Godel v’Holech (A Political Solution in Jerusalem: Possible at a Rising Price). 50 See, e.g., Uzi Baruch, “Barkat Menaseh Leshachnaya: Yerushalayim: Ad Lagader” (Barkat Tries to Persuade: Jerusalem: Up to the Fence), Arutz Sheva website, December 22, 2012.